Elizabeth and I just got back from a little mini-vacation. 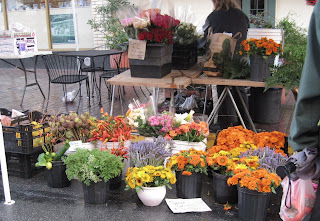 We had an awesome time down in San Luis Obispo shopping and eating and having fun. I have lots to share about that, and some pictures of some AMAZING goodies that arrived in the mail for me. They each deserve a delightful post and right now I have to go get sewing on some red and white fabric. Pronto. Celebrity Stunt Sewing is kicking into high gear. And my celebrity reads the blog and will know if I'm playing hooky. 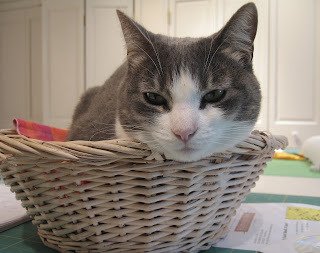 In other news here at the corporate offices of PamKittyMorning, I was over the moon when I heard that Tina, the Knitting Contessa, included me on her list of blogs that Make Her day. It made MY day! And what else makes my day.. YOU PEOPLES. I want to nominate everyone of you for this award. 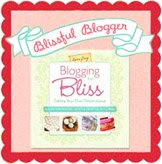 One of the things on my To-Do list is to update my blogroll so I can share all the blogs I read over on Bloglines. I have so many wonderful people listed here and listed there and I check in everyday to see what you're all up to. And if I'm not at home I'm checking on my Sidekick, because I'M JUST THAT WAY. So thank you Tina. You totally made my day. p.s. (I'm in love with p.s. 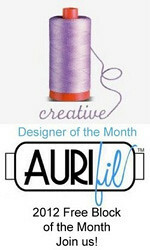 now) Cyndi at Wishful Stitches has made me her featured blog of the month. You'll see I have a new button up there, and a darling one at that. 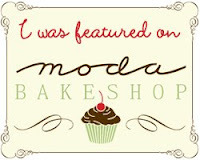 Cyndi is taking sign ups for her new newsletter as well.. hop on over to her blog. She's got a pretty new book coming out and I wish her every success. Well my happy little folk, I thought my days of unloading fabric from UPS boxes were over, but lookie here.. new fabric, wrapped in plastic, ready for the cutting. 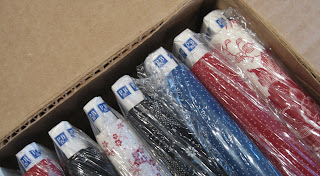 It's a sneaky plastic coated peek, because this is Alex's new line of fabric for P&B Textiles, Never Enough Romance. I don't even know when it's available, this is her advance yardage! I have the whole red colorway on my kitchen table right now. RIGHT NOW. I smuggled it in under cover of darkness. Ok, that was a lie. I'm just being silly now. It was 4:30 and still light outside. Seventy five. Yeah, it's crazy what I do for you my peoples!! Well some were blurry, some had crap in the background, some illustrated my failings in the mopping department, and a few noted that I really needed to change the water in the dogs dish. Instead of topping it off from the tea kettle, like normal. Well Rocket will thank me. Peep on the other hand, only drinks outside. Just wanted to show you the little mat my mother crocheted for Rocket's dish. She was bored, and had some strips that were too short for the rug. You know, I wrote here how my mother was crocheting the rug. Almost a YEAR ago. And not her fault at all, me and my lazy ways just couldn't get it together to cut more strips. She's working on one for Peep, she only eats in the living room (Peep, not my mother) and her current little rug looks pretty ugly. Yes, it's true, I have a dog that will only drink outside and eat in the living room. Go ahead and have a laugh on me. 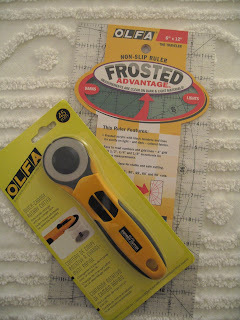 But you know I had that new Quick Change rotary cutter from Olfa and I have to honestly say, I LOVED IT. At first I didn't think that I liked it, it didn't seem to roll as smoothly, but then I got out my old cutter to compare and the difference was amazing. My old cutter is now set aside for paper only. I cut a lot of strips for my mom, and hopefully I'll get my rug, someday. You know, when the dog's rugs are done. *ok, how about good enough? Here it is. Finally. Did you wonder if I really even was going to work on this again? It's been a while since I even posted the fabrics. Sweet block huh? (** edited to add, blanket stitch by machine!) 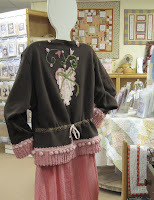 I just love the infinite possibilities of applique blocks. I can't wait to get choosing for my next block. I'm trying to pace myself. My celebrity sewing is done for this week and ready to drop off so I have some free to me time! Ok my sweet little raindrops. Tomorrow I'm up and out of the house to visit Sandy! We've been trying to get together for a month! I can't wait to see her sewing room makeover. Oh, P.S. Brenda is having a drawing for her new blog. Hop on over for a chance to win her new book which looks completely delicious. Elizabeth ordered a little goodie for me from our friend Lotta. Is it ever cute! 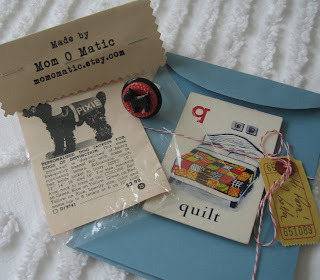 Lotta included the darling Q is for Quilt card as a special treat, she's just that nice! She's got them carefully mounted so you can remove the vintage card if you want. I think we all know I'll never be able to USE the card as a card, it's darling. I ordered a little Valentine's treat for Frankie from Lotta and that just came in the mail. LOVE. IT. In the meantime, been doing some of this. Made myself a list and started working on checking stuff off. Including but not limited to finishing up the bag prototype and pattern for Elizabeth, making a pillowcase for Frankie and a variety of dorky around the house things. Like vacuuming. It's all shocking I know. Ok, back to the list. Have fun my friends! Oh! And p.s. Elizabeth is having a drawing, hop on over and get in on it! **edited to add... here's where you can find a tidbit about what I was working on for Alex during my Celebrity Stunt Sewing last week. I see yesterday's post is chock full of comments about peoples fav tools. I am glad to hear I'm not the only one not changing their blade enough. I wonder what it is about that? Interesting since today's topic leads right into that whole blade changing thing. 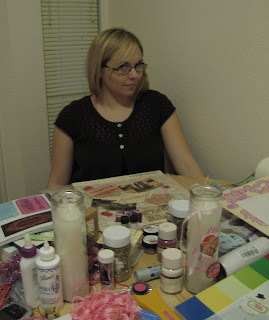 Last fall at quilt market I was very lucky to participate in the Olfa Designer Survey. 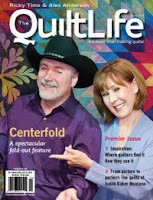 I felt a bit like a poser, but I do have two patterns out as a guest designer at Late Bloomer Quilts. My friend Roseann is the Olfa Education Coordinator, among many other things. She hooked us up. I'm anxious to try this new cutter. Olfa has come out with new styles of rotary cutters, but I've always clung to my original one, bought about 18 years ago. I like the slim shape. That's why I am sure I'm going to love this new one. The Quick-Change blade feature is what sells me on trying something new. They also sent a long this ruler. I've seen a lot of rulers over the years but I'm used to a 6 inch wide ruler and that's all my brain can handle.The 6 x 12 size is my favorite size ruler. 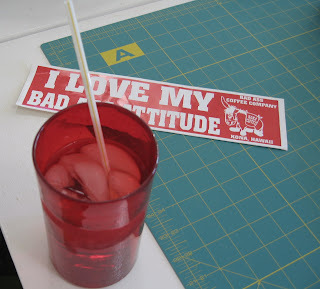 I find that it's the easiest to control for cutting accuracy and the ruler I use the most. I can't wait to try out this new frosted ruler. My eyes aren't what they used to be and I need all the help I can get. Thank you Roseann for including me in your program and thanks to Olfa for letting me test drive these new tools! 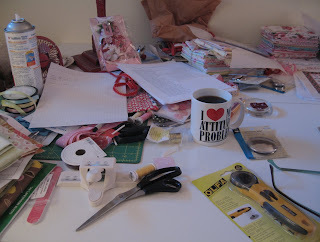 Time to head to the cutting table, have a great day sweet bloggy peeps! Good tools make your project a success in my book. I have a bad habit of going too long on a blade, needle or using my pins til they're bent and dull. So today I threw away all my old bent pins and put out a fresh pack, slipped a new needle in for some piecing and changed out my dull blade. You can't beat these pins for piecing or a Microtex sharp needle for the machine. And why do I continue to cut on a dull blade? Sometimes I'm just not using my head. So what tools do you love? Can't live without? Found this at my spot last week at Alex's. Word gets around I guess! Been at the sewing machine all weekend working on a CSS project. It's due Monday evening, so should be back here as soon as it's done. Hope you had a good weekend happy peeps! One of the places we headed out to this week was Thimblecreek. 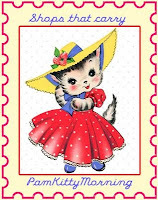 Sorry to miss my friend Chickie there, she's a doll and I'll have to go back on a Tuesday because I'd like to say hi! Well HI CHICKIE.. sometimes she takes a gander at the blog. Sorry I missed you and Sandy. 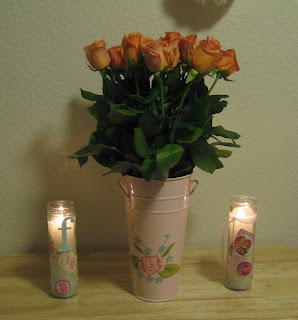 This cheery Valentine's quilt greeted you when you walked in. I love Valentine's Day and the whole happy red and white thing.. 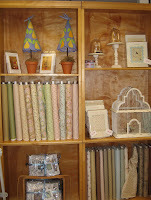 Here's a display of our friend Anne's fabric. What a sweet line this Miss Emma's Garden is. I love the cocoa colored background of the floral, and the wonderful dots. And the sweet bird in the floral, I love that. There's lot of embroidery at Thimblecreek. I believe Sandy has a drop in group for it on Monday mornings once a month. There is a whole section of thirties fabrics, which you know, are my favorite thing. 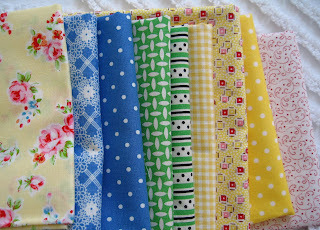 They are such cheerful colors and fabrics, what's not to like. 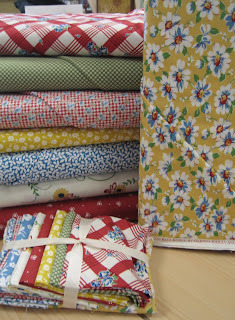 Speaking of 30's fabrics, check out the latest from Laurie. There are also cute garments and purses there... I love this cute jacket and skirt combo. 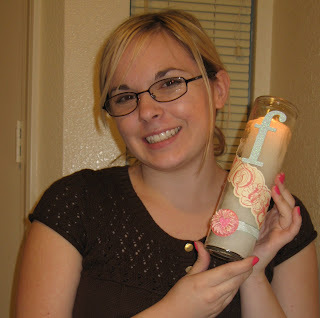 The designers is Kay Whitt of Serendipity Studios. Ran into one of my favorite bloggers there, Jackie! She was picking up a purse from Bari, another blogger. Bari makes some wonderful bags. Anyway my dears, a fun day was had.. but now, back to work. Alex is keeping my nose to the sewing machine. And I love it!! And other sites of my day. The duck is in that dog crate. Yeah, you heard me. A duck. We stopped in at The Quilter's Inn today. 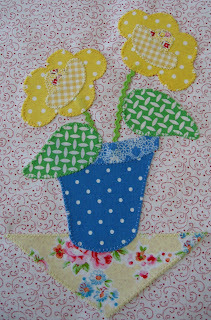 Jane and Kathy kitted up my version of the Flight of Fancy and you can see it there in the midst of a very cheery display for Valentine's Day and some springy fresh looking fabrics. See more of the happy outing over at Elizabeth's. She's got some photos that make me look as ridiculous as I often seem here! Quilt and be happy peoples! What don't I see. ROOM TO SEW. Pretty cute fabric huh? We just put this kit together last week. It's for an Atkinson Designs quilt from the Happy Hour book. I think everyone will know who gathered this fabric together, it's in my favorite color grouping, red/blue/yellow with a bit of green. Turns out it's my last kit there, as of today I'm off the schedule. I can't work the required full day and while my knees will thank me for it, it will seem a bit weird come next week, when for the first time in probably 12 or so years, I won't be working in a quilt shop. The last almost 6 at In Between Stitches. That being said, I'd like to thank all the wonderful customers for making my time there really great. Everyone has been so friendly and inspirational. Thank you to everyone who came from great distances to meet up and say hi. Big hugs to all my local people who come by every week and share their projects and progress with me. I'm moved by your friendship and generosity.That's what I'm going to miss! Big hugs to all of you. Ok bloggy peoples, I hope you have a great weekend, see you HERE next week. 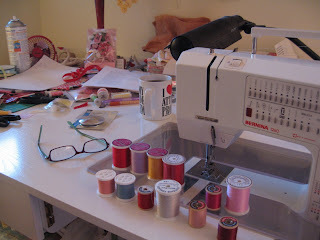 .. about another sewing day with Alex with special guest visitor Elizabeth? Look at sweet little Sparrow sitting on the table. She was not too happy with me today, I screamed and it sent her skedaddling! What was I screaming over? Alex is going to be on MARTHA STEWART'S SIRIUS RADIO SHOW TOMORROW!! I completely love Martha, have loved her from the first moment I saw that PBS Thanksgiving special 20 or so years ago. I even own some Martha Stewart Omnimedia shares.. a sweet gift from Bret when she went public. (NYSE:MSO) I thought it was exciting anyway. Seriously, Martha Stewart. 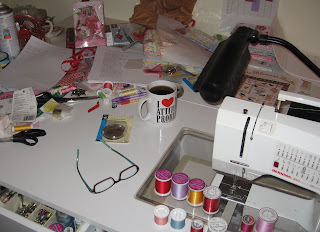 And talk about another holy crap moment.. get a load of that new sewing machine! 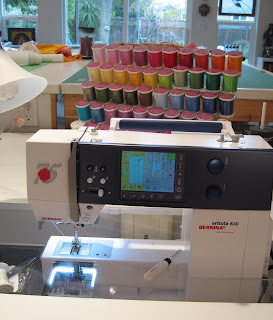 It's fresh out of the box from Bernina, the new 75th Anniversary Artista 630! It's really nice. I'd heard rumors that it sewed like my old Bernina and I have to say, pretty darn close. And believe me, I love that 1260 like a member of my family. Get a load of all that thread too! 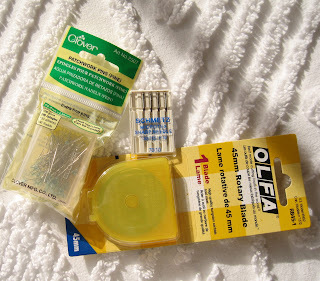 I love sewing with Alex's line of Superior Thread. 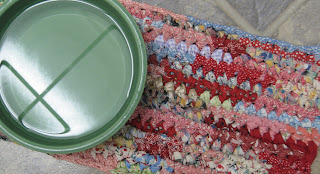 I use the big chunky spools myself but I sure don't have all the colors! Wouldn't it be great to have your own line of thread and have one named after you like 117? 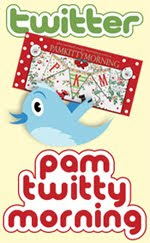 Hmm what color would PamKittyMorning be anyway? Tuesday Frankie and I had a crafty fun day at her place. I got up early and stayed till late and it was an awesome day. We checked out our goods, then headed out for some inspiration. And lunch. Mothers and daughters need lunch! Back at home we worked on some candles and she made a collage of some French postcards she had. Time flew by and and late afternoon we went back out to go to the farmer's market. I love flowers. 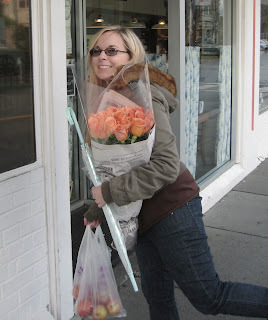 She loves the roses but I'll take a sweet bouquet of mixed flowers any day. Look at all the orange! 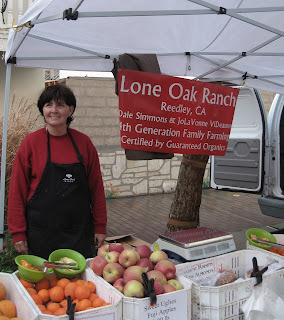 We bought a couple of pounds of the best apples from Lone Oak Ranch. I'm hoarding my last apple, a Sweet Ugly Fuji. I suspect I'll need to go back there next week. We both agreed we didn't get enough. Doesn't my girl look happy? 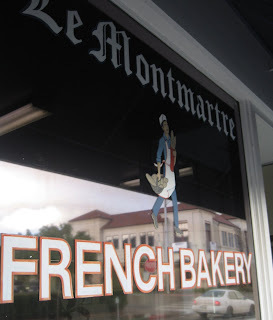 She's taking me to a little French bakery. She doesn't even like pastry.. but I still love her. I got a mini Napoleon and now I just wish I had about 50 more. Why did I say mini? So we glued and cut stuff out and watched one of my favorite movies ever. And then it was 7 and I had to go home. I couldn't have been luckier this morning than to be working with Sheryl. I don't see her that often, she's a super-hero called into save the day. I folded fat quarters while she worked on the bags and we had a good catch-up before customers came in. You can tell by her beautiful smile that she's really a great person. Thanks for helping me out today Sheryl! 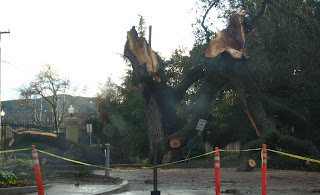 We were quite lucky here at home, no damage at all from the storm, no power failures. Many weren't as lucky I'm sure. There was a lot of rain on Friday. 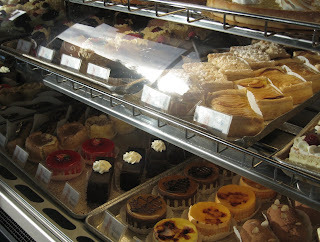 I went out in the early afternoon for a quick trip across town to Elizabeth's. Had to check the local storm canal, or whatever it's called. Never have I seen more than puddles in there. 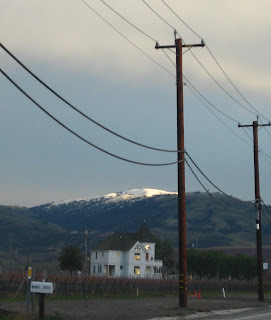 We used to walk past this on the way to the elementary school, lo those many years ago. I never consider my neighborhood vulnerable to flooding, but clearly that's probably naive, although we're uphill from here. On my way I encountered a road closure! Never saw that before either. Bret and I went out on Saturday but couldn't see any reason for it, no tree damage and no sign of flooding. 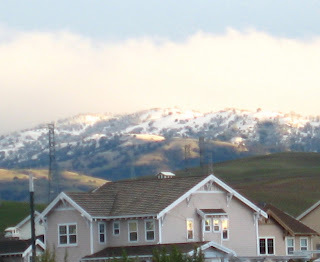 The hills were dusted with snow Saturday which is always beautiful. If I saw this in a photo I would never suspect that it was my own town. The saddest thing I saw was at the entry of Alden Lane. I hope you're all safe and warm my sweet peoples. Have a good week! Yup, I was doing some more Secret Celebrity Stunt Sewing Thursday. I started working on a project for Alex before Christmas, but was felled by that vile cold. I spent all of Thursday at this fab machine and it was great. Not like I'll turn my back on my 1260, but I've figured out the differences and using this Aurora 440 Quilter's Edition will help make using my 180 a little easier. There's a little someone to keep me company too, and a tv where I can watch Crossing Jordan. And it's clean and sunny and bright. Well, sunny till it got all cloudy. We're having a nice storm here. It was still bright though because she has the best lighting EVER. And there was the ebb and flow of people that kept it interesting all day. And clean, did I mention clean? Alex showed me this today. Now I must have this. And Bernina owners, have you seen this? 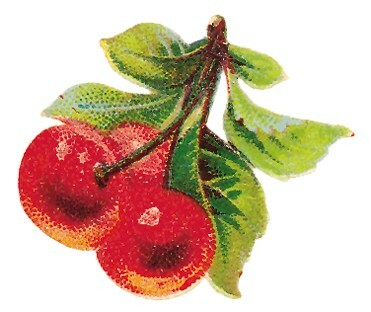 I was flipping through my new Mary Engelbreit Magazine and saw some of the cute Cherry Baby Lakehouse fabric. And a lot of other wonderful Pink Stuff. And all I did was flip the pages, I haven't even read the magazine yet. Don't you just feel happy when you make stuff or see stuff or think about making stuff? I do.